Bonnie's rules for being a better client - she has more than 60 in her delightful new book. 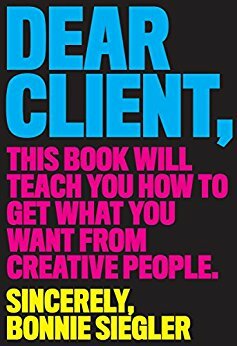 What others thought about "Dear Client"
In this practical, easy-to-follow guide for the client in a creative collaboration, Bonnie Siegler, an eminent graphic designer, directs the reader with a light hand through the pitfalls that often occur between client and creative professional. Her advice is nonjudgmental, with a sense of authority derived from working with clients such as Oprah and Saturday Night Live. Each concise chapter of this prescriptive book will walk you through the different phases and experiences of the creative process, such as how to communicate to a design team exactly what you want (adjectives are your best friend), which words or phrases to avoid so as not to stump the designer’s creativity (don’t say “Make it bigger”), the importance of designating one decision-maker, how to be open to something you didn’t imagine, and how to establish clarity of purpose. With informative and amusing stories of good and bad clients, How to Work with Creative People is a game-changing and approachable handbook for achieving a productive and enjoyable relationship with creative professionals, and is sure to join the canon of breakout visual business books such as Rework or The Power of Habit.